For more information, contact Amy Ruedas with TAC’s Legislative Services Division at (800) 456-5974. 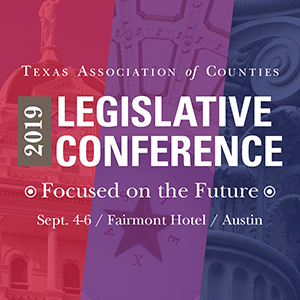 The 2019 Legislative Conference, set for Sept. 4-6 in Austin, offers county officials and staff an overview of the 86th legislative session and an opportunity to network with county officials from every office, plus legislators, and other experts about the issues that affect your county and your constituents. For more information, contact Haley Click or Deanna Auert at (800) 456-5974. Join us this summer for the most important conference in county government. For more information contact Haley Click or Deanna Auert at (800) 456-5974.